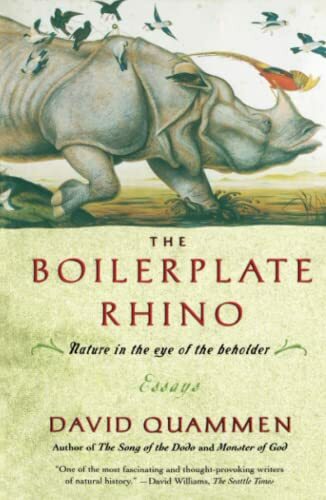 A great collection of essays on natural history and nature in general, ranging from a declaration of love for trilobites to travels in south-east Asia to Albrecht Dürers picture of a rhinoceros he'd had described to him but had never seen ("the boilerplate rhino"). That was a long sentence. David Quammen writes in an intelligent and easy way and with great love of his subjects. He's the kind of writer you feel you know after having read his book. You'd think a boilerplate rhinoceros would be to heavy for me to pay postage on, but how wrong you were. Sent today as the start of a two-book bookring (say that quickly 14 times) together with The Lying Stones of Marrakech to Yubi40 in Switzerland. Take good care of them. Received today! Thanks! Will post comment after reading and send it on! Great book! Long time since I enjoyed a book so much! Loved each page of it! Each of the 25 essays is a small universe of its own! I'm only sorry I haven't "met" Quammen before! Now you got me hooked! I'll see that I can read the other books he's written! I'm going to pass the book along ... but I've asked my favourite bookstore to order 2 copies of it: one for me and one for a good friend ;-))) I have to re-read it again, slowly. Released on Monday, May 26, 2003 at Ufficio postale in Lugano, Ticino Switzerland. Sending it to the next in the list Lisa-B: happy reading! Thanks to Yubi40 and to Too-Ticki especially for starting this non-fiction bookring. Your comments sound very promising, and if I wouldn't anyway because it's a bookring book, I'd start it immediately (after the one I am currently reading). A pretty good read, although I sometimes wished for a more in-depth discussion of things. But, as the author wrote in his introduction, the essays had been written for a popular outdoors magazine and therefore were restricted to 3000 words, and also the readers might not have appreciated too many scientific details. I am mailing the book to Biba89 within the next few days. I hope yopu enjoy it! I received it today as part of the Quammen-Gould Bookray. I will start reading Today! And, now that I have finished, I would love to read everything by this Quammen guy. Who says bookcrossing isn't good for sales of books? David Quammen has a very original view on nature, microbes and durian fruit and he takes me all over the world to share his view with me. And, being from the Jane Goodall Institute, I especially appreciated his essay on chimpanzees and whether we should accept great apes as part of the human community. He expresses love for life in general. Released on Wednesday, July 23, 2003 at to fellow BookCrosser in Deventer, Overijssel Netherlands. The Rhino stampedes through the mail, on his way to the next crosser. Jolanda, grab a lasso, girl, and catch him! The rhino landed in my postbox this morning. The comments so far are promising, can't wait to get started. Finally finished this book. very good read, I only wished the essays where longer. David Quammen is definitly on my list for more-to-read. Thanks for introducing him to me Too-Ticki. Released on Monday, September 22, 2003 at Another Bookcrosser in Rotterdam, Zuid-Holland Netherlands. It came back in the mail to me a couple of weeks ago. I tried to contact Leanne345, but never heard back from her. As I've almost finished the Gould-book, I'm sending both books to the next person in line soon. Books arrived today...love the postcards, will start reading them this weekend and come back to journal. Jolanda - thanks again for mailing these to me! David Quammen is great! I truly enjoyed reading this book. All this time, I thought SJ Gould was THE only man who could make me enjoy natural history. Well, now I have to go get a copy of 'Rhino' and the rest of Quammen's books. I echo the previous readers review of the books. Too-Ticki - Thanks so much for starting this ring! I have begun 'Stones' and will be finished in no later than 2 weeks! Thanks all for your patience. Came home last evening and found a Rhino and a companion on my doorstep! Apparently the postman wasn't even going to try to get a rhino into my mail slot -- what wonderful judgement he shows. Looks interesting, and I hope to get to this very quickly. Fascinating. I went to the library and got another title by this author and by Gould. I'd forgotten how enjoyable natural history essays can be. Thanks, Too-Ticki, for starting this double ring. The rhino's safely home, and less battered than I thought it would be. Thanks everyone, hope you enjoyed it!